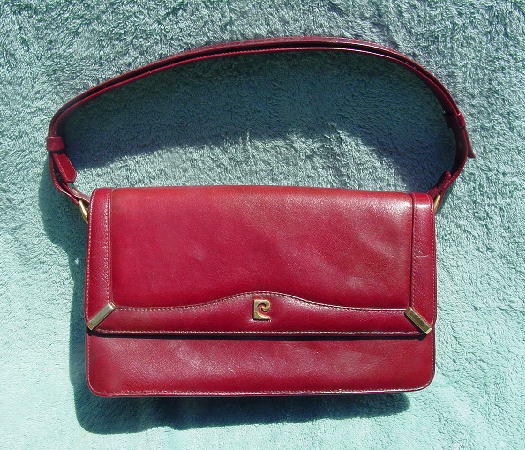 This vintage cran-apple color leather and faux leather purse is by Pierre Cardin. It has a double strap which snaps on one side. The exterior feels like there is a little bit of padding behind it. It has an envelope styling with a gold-tone metal logo on the center and a gold-tone metal angled bar on each bottom corner of the flap. 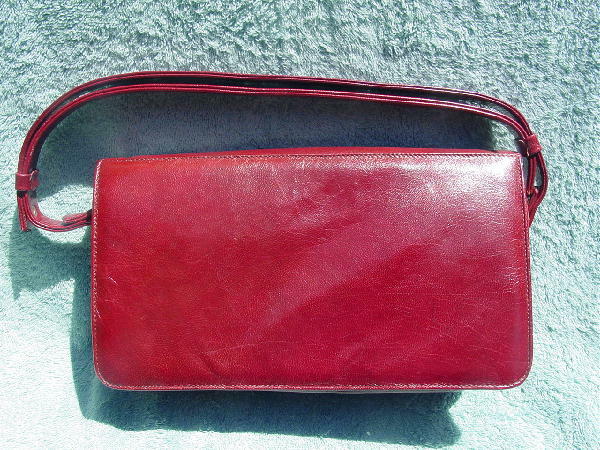 The interior has three sections with a fabric lined large zippered pocket. The center section also has a fabric lining. The front left side has a line mark, and there is some darkening to the leather to the right of the left corner gold-tone bar, and also on the right inner side. There is a hidden snap closure under the Pierre Cardin logo.